Comply with all of the General Criteria for Written Assignments. 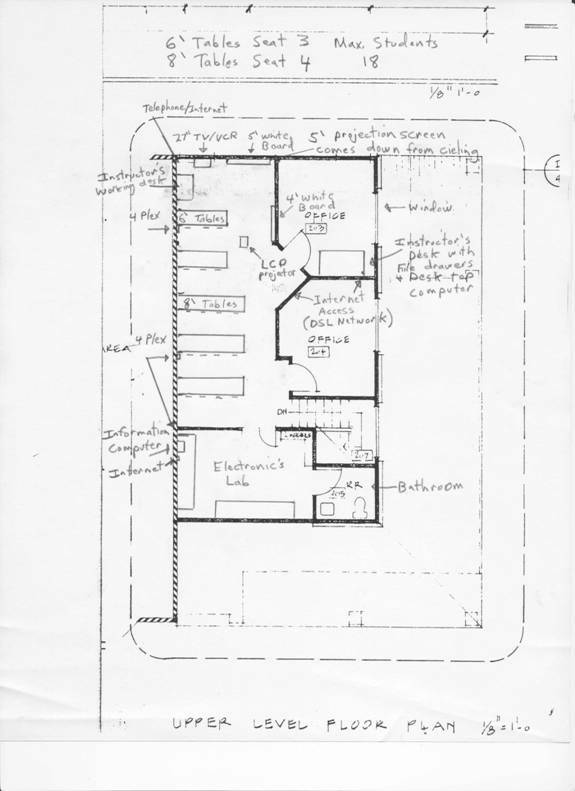 Draw a floor plan to scale on an 8.5 by 11 inch sheet (or the drawing may be produced on a personal computer). Typically each square on the graph paper would represent one foot, but can be assigned any value that would result in a "to scale" drawing that will fit onto one page. Include the overall dimensions of at least one room in the drawing and accurately indicate the location of all doors, windows and other permanently mounted fixtures. Be sure to include information about electrical, telephone and internet connections as well as information about lighting, plumbing, flooring and walls. Provide Information about equipment (desks, chairs and/or other special equipment) that will be housed in the facility. Make sure to allow for appropriate space needed for student use. Neatly print appropriate information on the actual drawing. Insure that the drawing is done in a professional manner and that everything included in the drawing is drawn to scale. If drawing on graph paper, use a ruler to make straight lines. Indicate the maximum number of students that the room can accommodate and insure that the drawing conveys accurate information that represents what the room should (or does) actually look like. Fournier, Phil - From my own professional experience. www.smartdraw.com (a website where software is available to do some simple drawing of floor plans). I believe that the attached floor plan meets all six of above listed criteria and respectfully request full credit: one point for meeting each of the above listed criteria. The following scanned-in drawing is for the off-campus classroom located at Phil’s Auto Clinic, 111 N. Soboba St., Hemet, Ca, in the upstairs section. Max. student seating is 18 behind tables that work well for in-class lab work using simulator boards and oscilloscopes or voltmeters. Scale is 1/8” = 1 foot. I used this classroom for my MSJC class from 1995 to 2001.